Earning an MBA online has become an increasingly popular option for those looking to advance their careers, and with good reason: online degree programs offer the flexibility needed to maintain busy work and home lives while still balancing a full class schedule. Schools have seen this increased need for such programs, and have answered; there are now hundreds of online MBA programs in which prospective students may enroll. To help narrow the field, we’ve analyzed every online MBA program in the nation by cost, supportive services, student teacher ratio and accreditation to determine which schools stand on top. 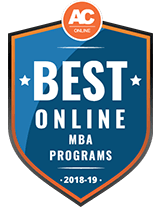 Discover the Best Online MBA Programs for 2018-2019 below.